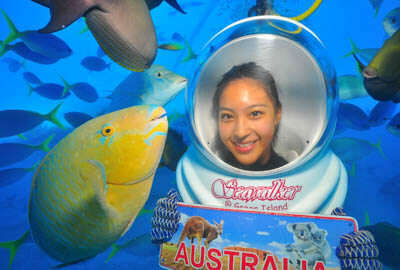 Walk on the sea floor of a Great Barrier Reef island! It’s fun and easy! Ideal for non-swimmers and no experience is necessary. 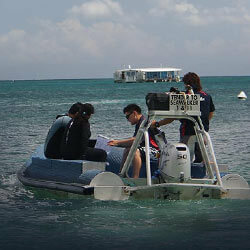 Your whole underwater experience is fully supervised by our qualified instructors. 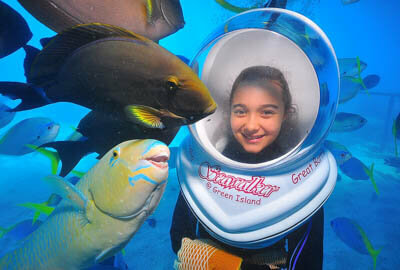 Seawalker Green Island offers an amazing underwater helmet diving experience on the Great Barrier Reef. It’s unique in that you walk on the seafloor surrounded by colourful tropical fish and corals at beautiful Green Island, a 6000 year old coral cay. There is no equipment to operate and non-swimmers are welcome; Seawalker is accessible to almost everyone and you don’t even have to get you hair wet! 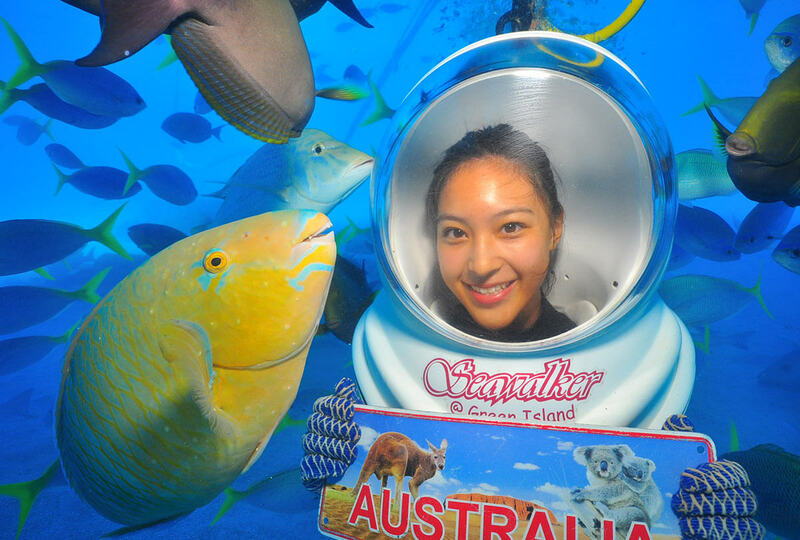 Immerse yourself in the marine wonderland of the Great Barrier Reef and discover the underwater world from a different perspective. It’s a fun and engaging adventure you can share with your family and friends. Listen to a 5 minutes simple and informative safety briefing about this unique experience. 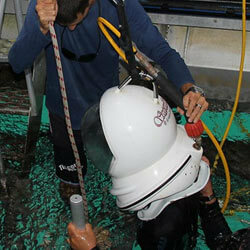 We will lower the Seawalker helmet onto your shoulders and send you into the water with our experienced and qualified guide. 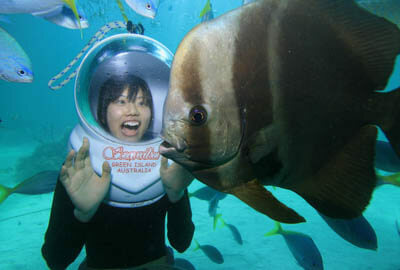 Walk and enjoy the beautiful coral and colourful fish that surround you in the Great Barrier Reef. 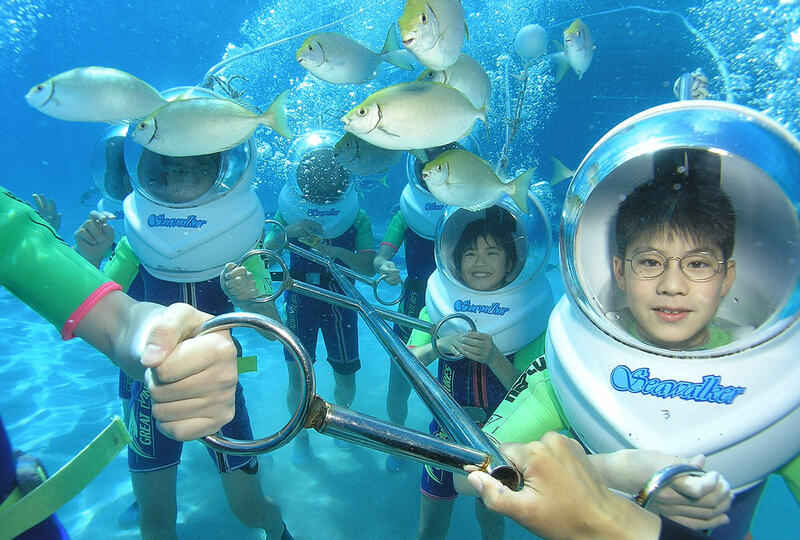 You’re just a few steps away from an amazing underwater adventure! After boarding the vessel, simply make your way to see our friendly staff. They will assist you to complete the next steps such as completing necessary paperwork and arranging the most suitable time based on your Green Island schedule. 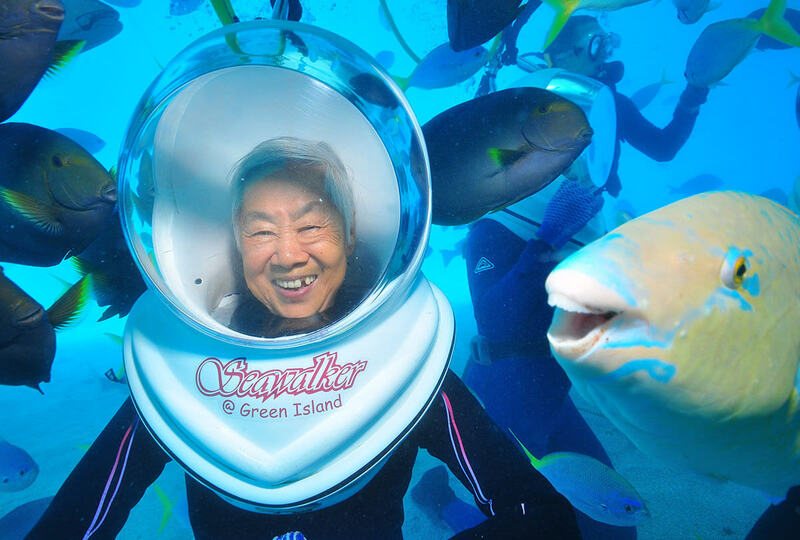 Meet us at the Green Island dive shop before your allocated time so that our staff may assist you with preparing your Seawalking gear. The wetsuit and dive boots will give you full protection from the underwater elements. Before going underwater, you will need to know a few pieces of information, such as how to communicate. The safety briefing will take approximately 5 minutes and our staff will be available to answer any questions that you may have. Our staff will lead you to the beach where you will board the transfer tender. The transfer to the dive support vessel will take approximately 5 minutes, so keep an eye around the boat for a good chance to see sea turtles and other wonderful marine creatures. When it’s your turn, we will lower the Seawalker helmet onto your shoulders while a professionally trained instructor will assist you for your 5 meter descent to the white sandy seafloor. You are now ready for seawalking. Your experienced guide will show you the beautiful coral and schools of fish. At our underwater location, you have an excellent chance at having a photo taken with ‘Gavin’ the famous photobombing parrotfish. 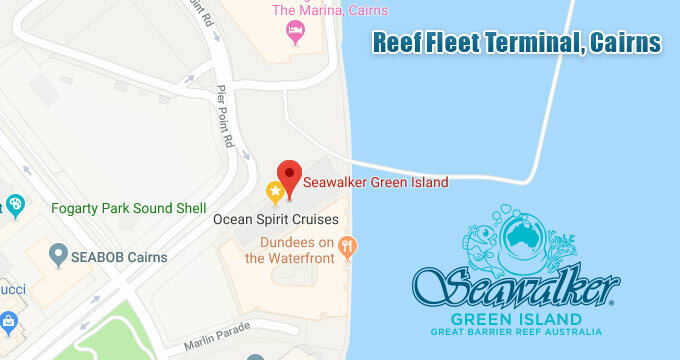 Seawalker is an optional activity with Great Adventures’ Green Island cruises. 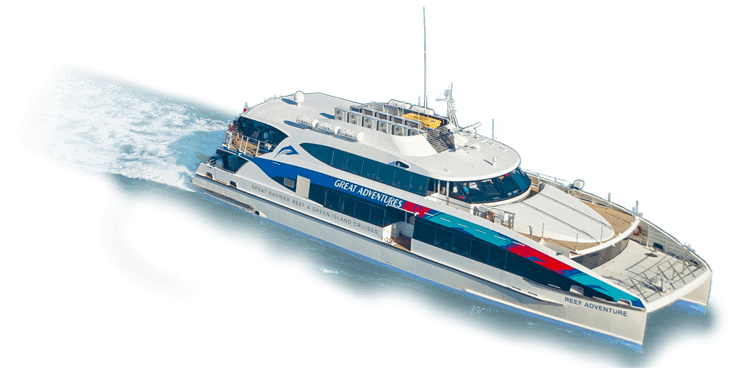 Your transfer ticket to Green Island is at an additional cost. Check-in at Great Adventures counter inside the Reef Fleet Terminal, 1 Spence Street Cairns. Check-in is 30 minutes prior to scheduled departure time. SEAWALKER PRICE: $180 per personPrice is in addition to your cruise fare to Green Island. PACKAGE & SAVE save $36Save $36 per person when you package Seawalker with Great Adventures’ Green Island Eco Adventure. In addition to your Seawalker experience, your Green Island Eco Adventure also includes the choice of snorkelling or a glass bottom boat tour. We recommend pre-booking Seawalker to avoid disappointment as daily spaces are limited. You can however book onboard your Great Adventures cruise or at the Island Dive Shop, dependent on availability. Are all seasons suitable for seawalker? 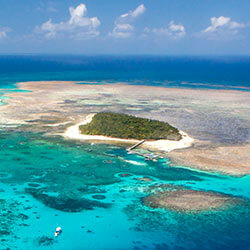 The warm waters of Tropical North Queensland make for year round comfort for water activities. In cooler months however, the complimentary wet suits will keep your body warm. Will the water pressure make me uncomfortable? You will descend down the ladder slowly, so it’s easy to equalize the pressure. 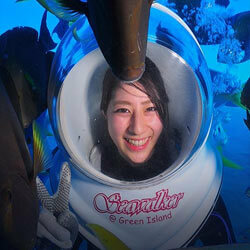 Is there a minimum or maximum age limit to do Seawalker? The minimum age is 12 years old, but there is no upper age limit providing you pass the medical questionnaire. How deep will we go? Your instructor will guide you down to around 5 metres deep, an ideal and comfortable depth to experience the reef in a stress free environment. What if the weather is rainy or cloudy? You will be walking alongside the coral and fish underneath our platform. Even during poor weather, you will still be able to have a great viewing experience close to the reef and marine life. Can I take my camera or GoPro underwater? No. 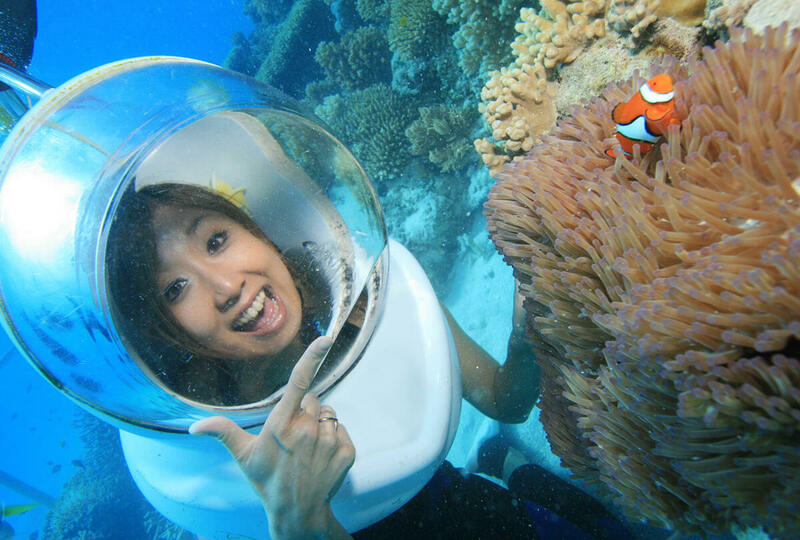 Due to safety procedures you will be unable to take a camera underwater with you however a professional photographer will take your photos and these will be available to purchase. Can't find the information your looking for? Please fill in below form or give us a call and we'll get back to you as soon as we can, thank you! 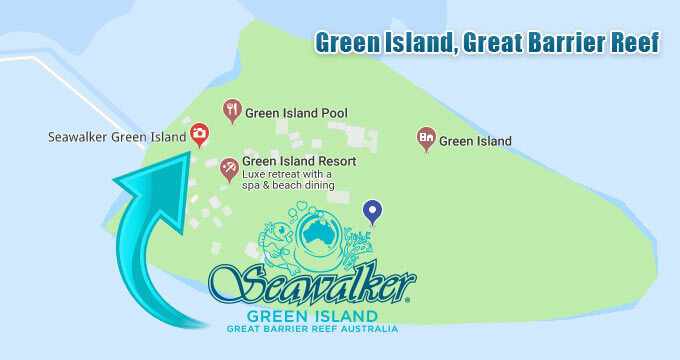 Since 2003, Seawalker Green Island has been showing guests the wonders of the Great Barrier Reef up close and personal. We’re accredited with Advanced Ecotourism Certification and also the proud recipients of the Queensland Tourism Awards “Adventure Tourism” Award.